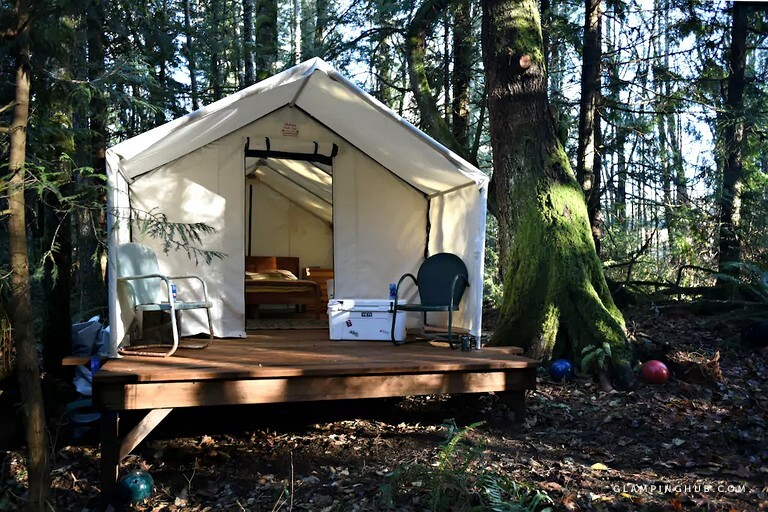 This unique outdoor getaway is perfect for adventurous couples and is located near Galbraith Mountain, Bellingham. 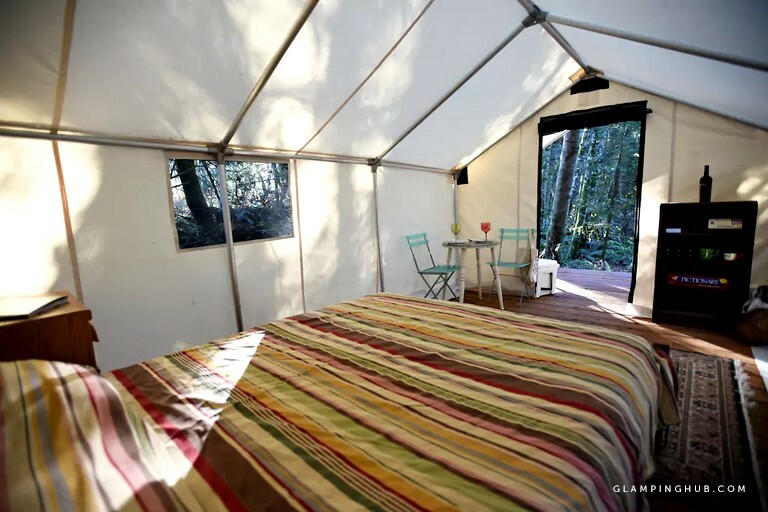 The tent accommodation is nestled amongst the forest on a secluded private road and has one bedroom with a comfortable queen-size bed. 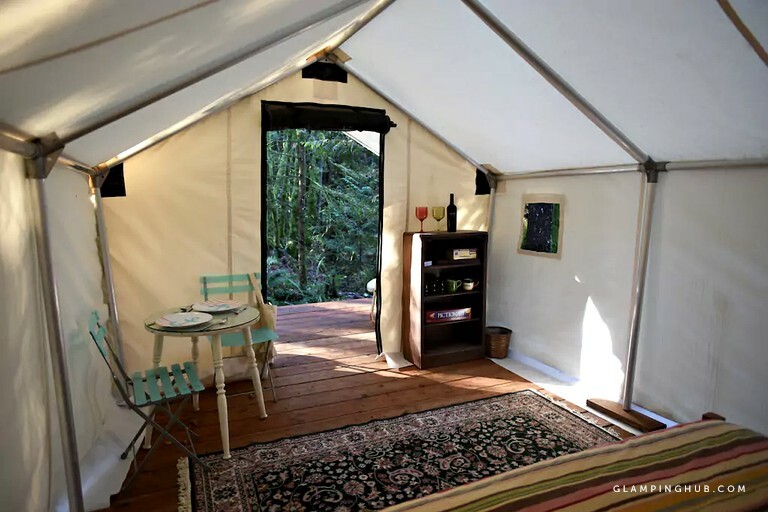 Glampers can enjoy time unplugging and be at one with nature with no electricity, heat, or Wi-Fi distractions. 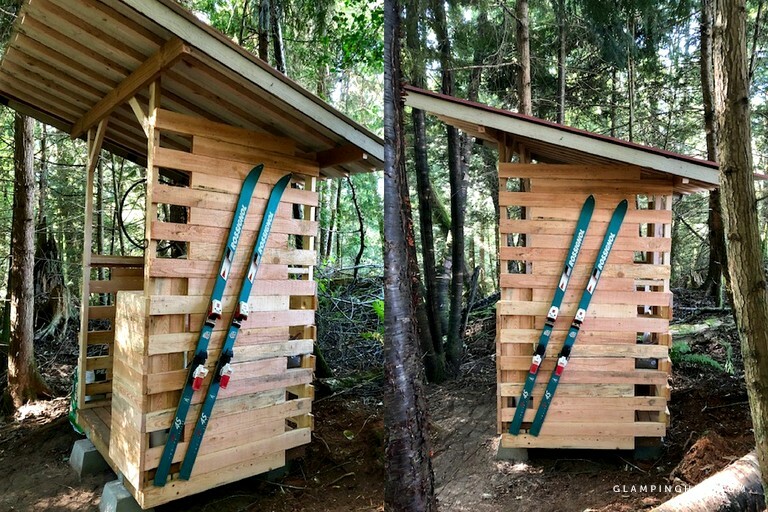 There is a composting toilet in the outhouse and a five-gallon water jug for cooking and drinking. The jug is refillable, and the hosts will happily refill for guests on request. 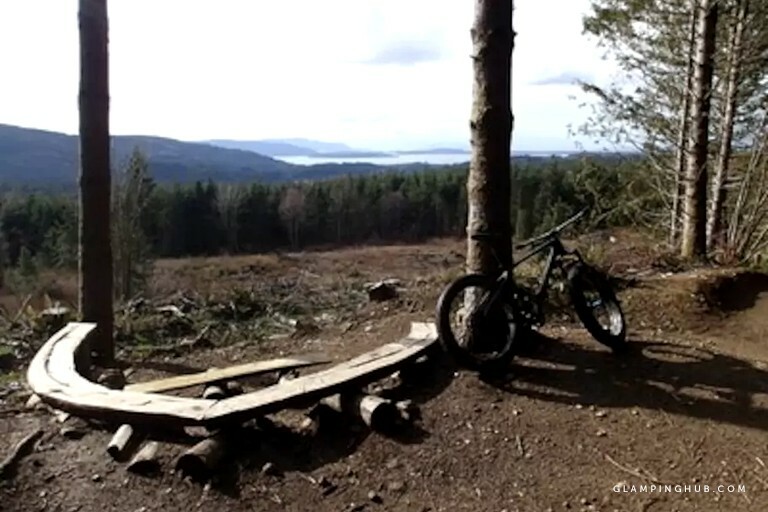 The accommodation has private trail access to Galbraith Mountain with amazing hiking and biking routes. The hosts are also able to supply local information to ensure glampers can enjoy the best routes. A cart is available for check-in and check-out to help guests get settled and to transport supplies to the accommodation. There is a cooking top, a cooler, and all essential cutlery and dishes for cooking meals. 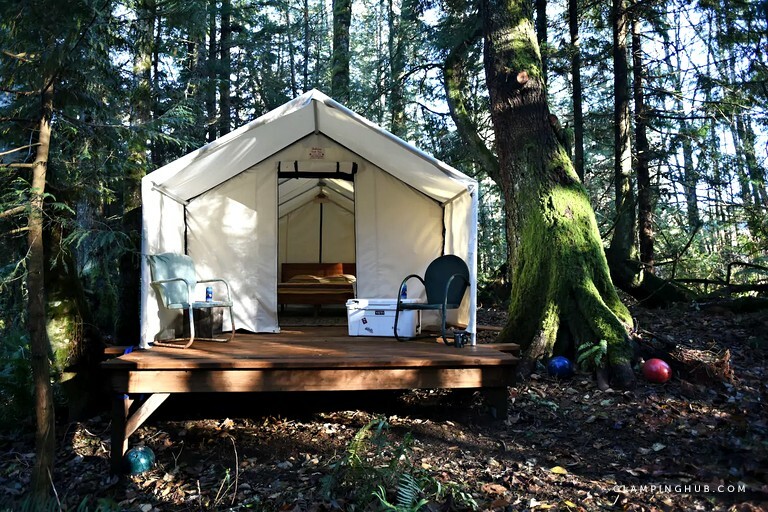 Glampers need only bring food supplies and all essentials needed for an adventurous biking trip. Facilities include a convenient wheelbarrow to help transport gear to the accommodation during check-in and check-out. Dishes, a cooler, and a refillable five-gallon water jug are available for cooking and drinking purposes. There is also a fire pit and a picnic table with exquisite views of the area. 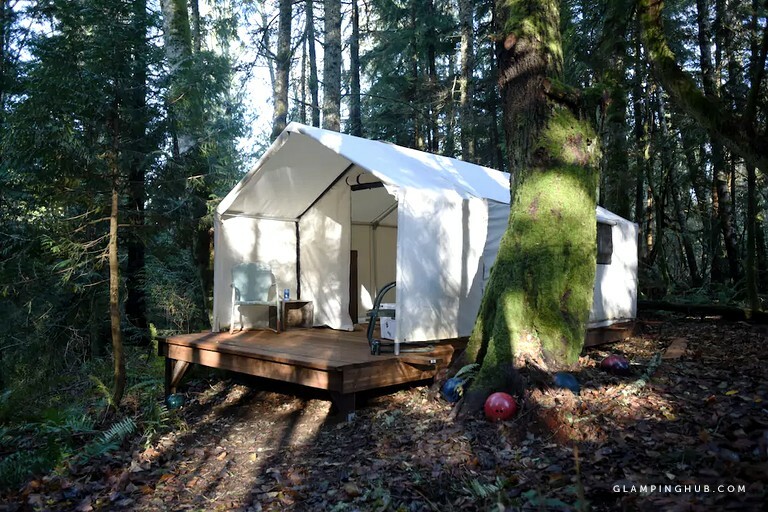 This glamping accommodation is situated on a peaceful private trail with access to the stunning Galbraith Mountain, which is known for its amazing hiking and biking trails. The property is very secluded on a private road surrounded by forest. The accommodation is 15 minutes from the coastal city of Bellingham, where guests will find a vibrant community and many attractions, including the SPARK Museum of Electrical Invention and the Whatcom Museum, which showcases art, nature, and regional history and the renowned light catcher building that has curving, translucent walls. There are numerous areas of outstanding beauty nearby with lakes, beaches, and beautiful park areas. 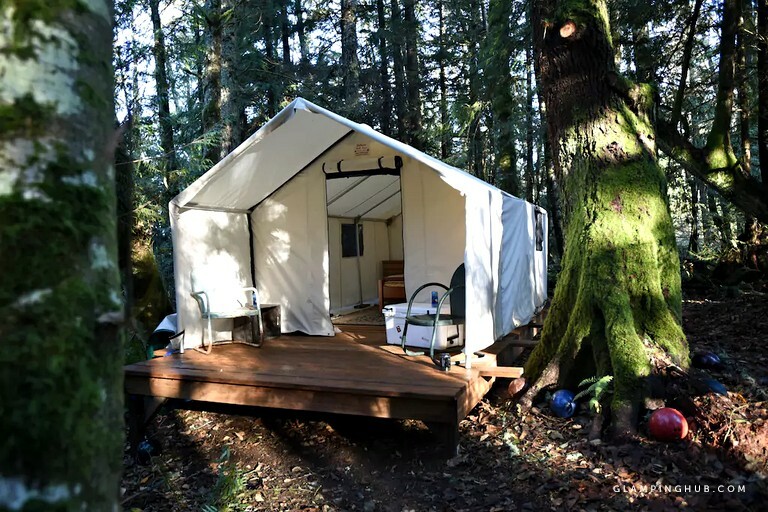 From exploring the abundance of hiking and biking trails to enjoying the Bellingham farmers market, glampers will have so much to choose from during their stay. 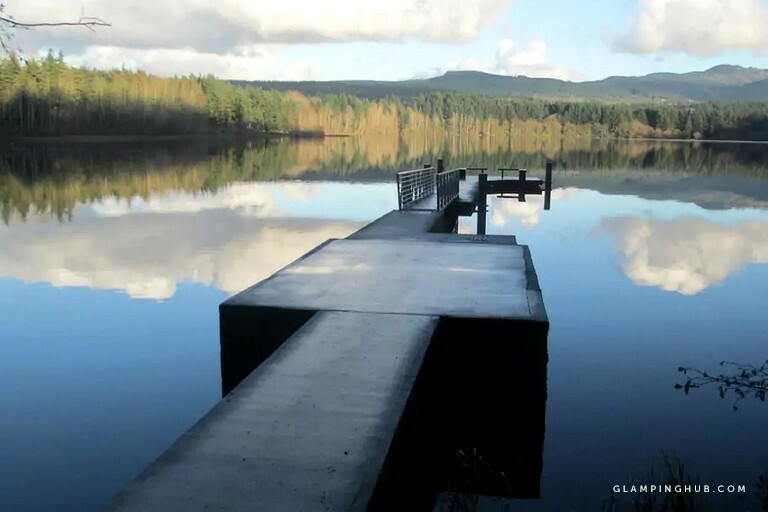 There are many hiking trails on the doorstep on Galbraith Mountain with alternative routes nearby including the Whatcom Falls Park, South Bay trail, and Chain Lakes Loop. The Interurban Trail offers additional stunning bike trails to discover. 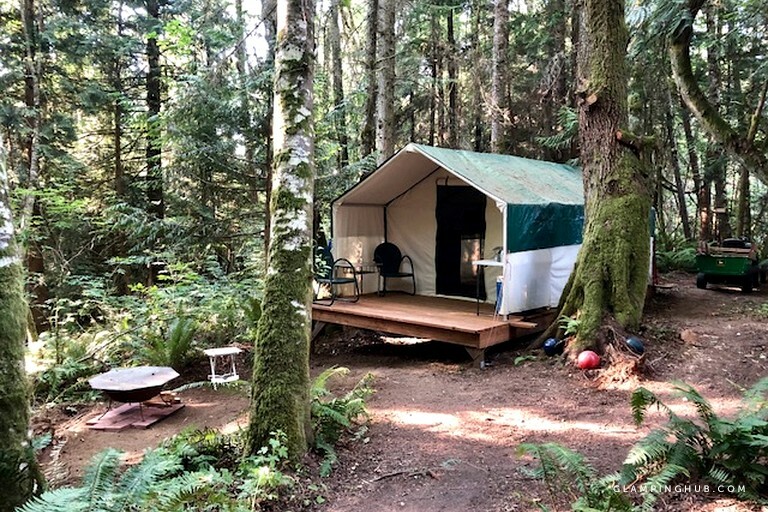 Other outdoor pursuits include river rafting, tubing, and sightseeing at Lake Padden Park, Nooksack Falls, and Lake Whatcom. 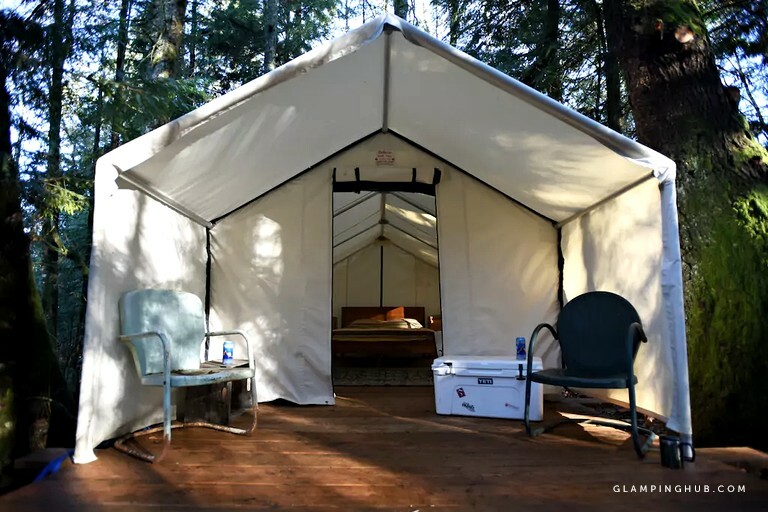 Glampers can immerse themselves in the local community and wander through Fairhaven Historic District, before sampling local brews at the Chuckanut Bay Distillery and Fairhaven Stones Throw Brewery. There are many performances to enjoy at Mount Baker Theater, and beautiful gardens to admire at the Big Rock Garden and Sehome Hill Arboretum. 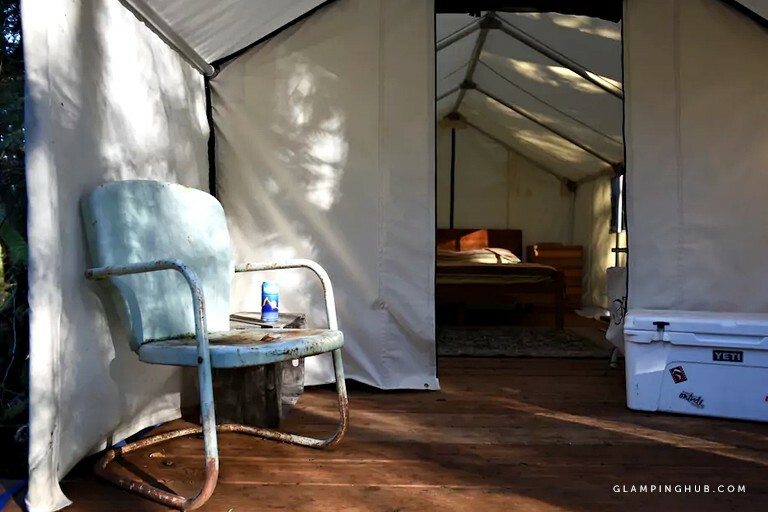 Glampers are advised to bring food supplies and all essentials needed for a mountain biking trip to spend time enjoying this unique retreat. 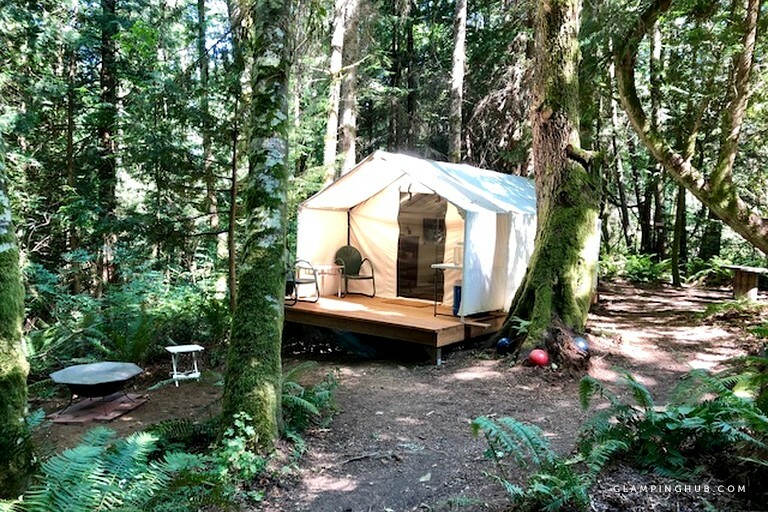 Please note the accommodation has no running water, heat, showers, or Wi-Fi, and is a unique experience. 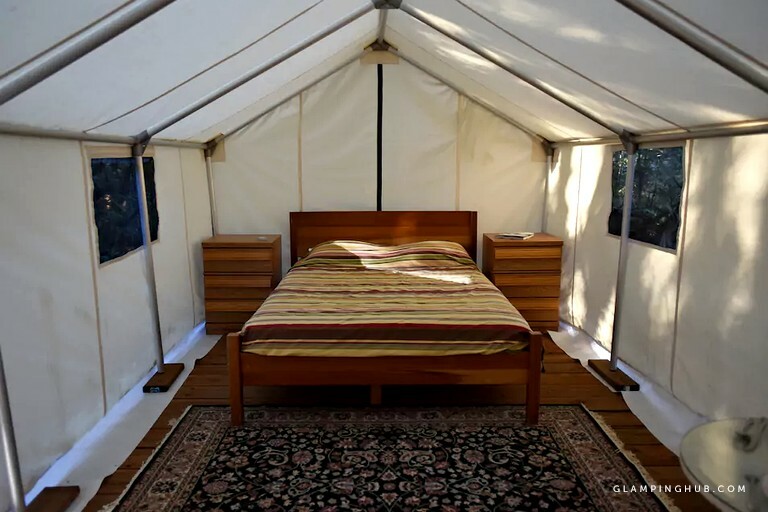 Glampers are asked to be quiet after 10 pm. No smoking or parties and events are permitted.